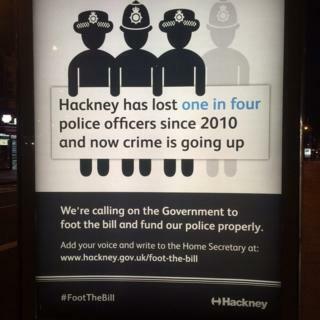 Hackney Council has launched a campaign against police cuts, asking its residents to complain to the Home Secretary. Posters put up around the borough ask residents to "add your voice" to the councils "Foot the Bill" campaign. The council says Hackney has lost one in four police officers since 2010 and that offending in the borough is now increasing. The Home Office claimed it is investing more in the police system. The council campaign calls on the government to abandon further planned cuts to the Metropolitan Police budget and to increase its funding. The authority said Hackney has seen a cut from 770 officers in October 2010 to 584, while the borough's population has risen. Councillor Caroline Selman, Cabinet Member for Community Safety and Enforcement, said: "Our police do a fantastic job in Hackney, but years of pioneering and progressive partnership between the police, the council and other organisations to bring crime down over the past 15 years is being put at risk by short-sighted cuts to the police, and now crime is now going up. "The police simply do not have the resources they need, and ministers' platitudes about being more efficient do nothing to address the reality on the ground or the rapidly growing concerns among our residents and businesses." A spokesperson for the Home Office said: "There are more officers for each Londoner than anywhere else in the country and in 2017 the taxpayer is investing £11.9bn in our police system; an increase of more than £475m from 2015. "This government has protected overall police spending in real terms since the 2015 spending review and announced additional funding for counter-terrorism policing." London Deputy Mayor for Policing Sophie Linden said: "The government must urgently go much further and agree to real terms increases in police funding over the coming years if we are to maintain officer numbers and keep the public safe."